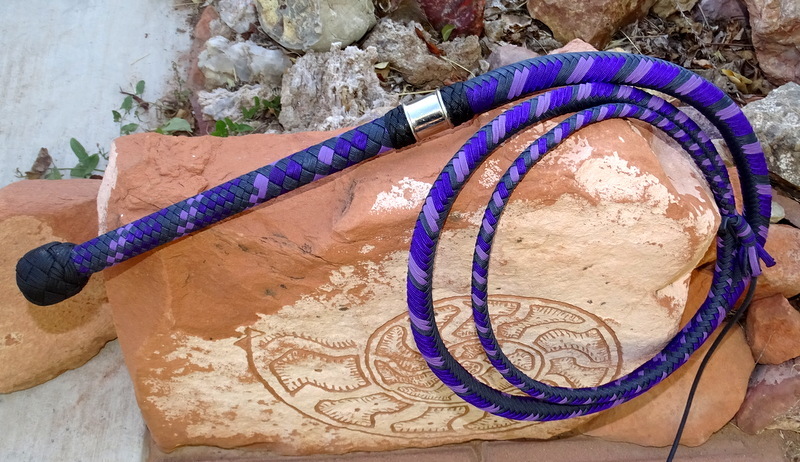 I offer two different whips That are made to Anthony's specifications for his rolling loop style. Both come with his signature long handle. 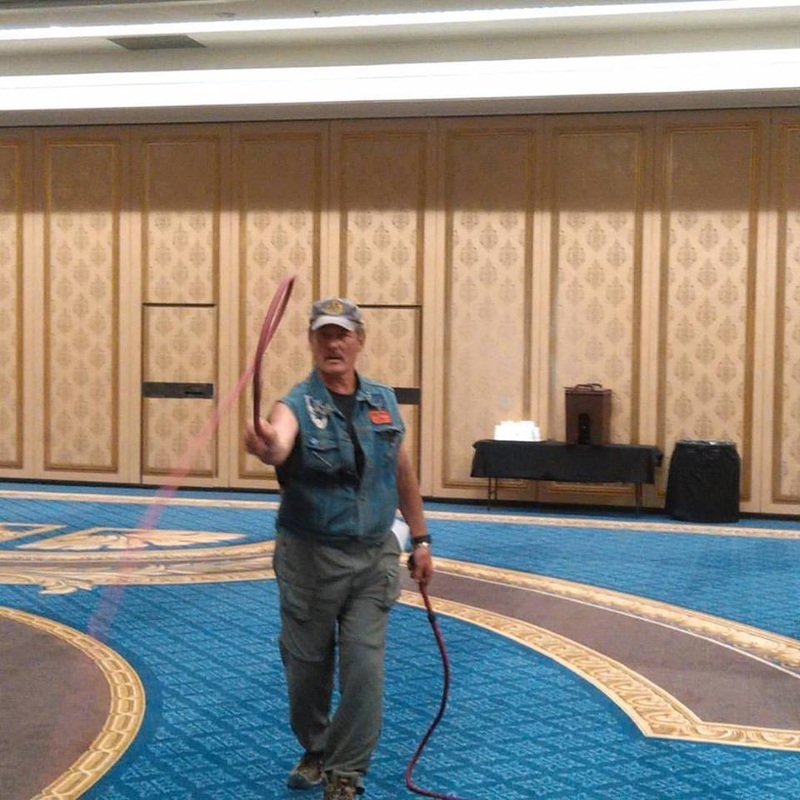 The Delongis Alignment- A few years ago at CombatCon I was able to talk to Anthony about where his whip work was going and exactly what his needs are now. We both think the DeLongis Alignment is the best whip to do the job he needs and slightly easier to handle than the Valkyrie. The Delongis Alignment is the lighter of the two whips and faster, but still just as accurate. It comes in 7 foot 16 plait only. It has a medium shot load and one braided belly and a medium weighted fall. 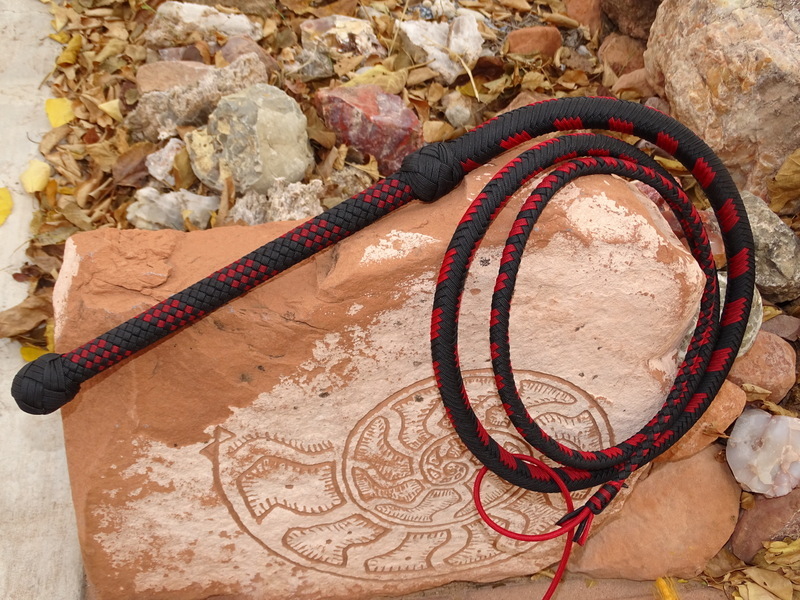 This is the whip you want if you are learning foot work or need something that isn't quite as heavy. It can be made in any color or pattern that your heart desires. 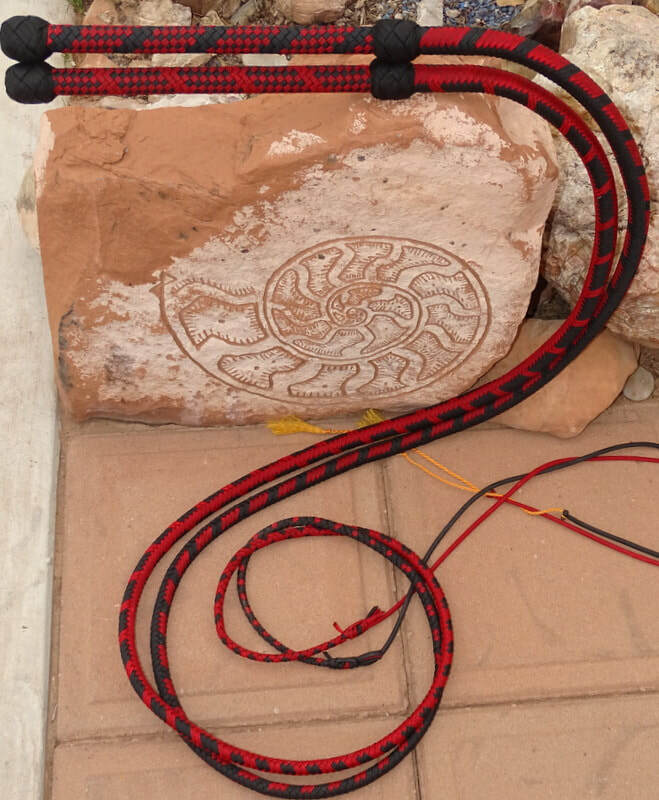 The Valkyrie has the largest diameter of all of the whips I make but still comfortable for a smaller hand. It is heavy but balanced and alive at the same time. The Valkyrie comes in 7 foot length only. It is either 16 or 18 plait, with a Heavy shot load, 2 braided bellies, and a 1 ounce fall (or a lighter fall upon request). 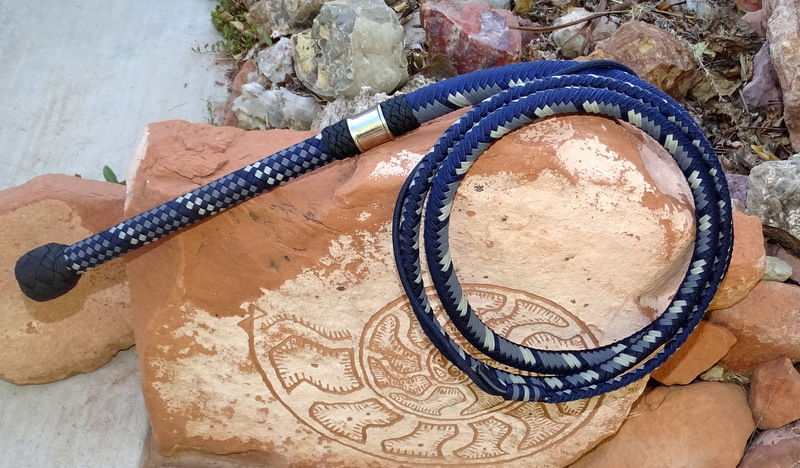 Pick this whip if you will be working from horseback or need extra weight. 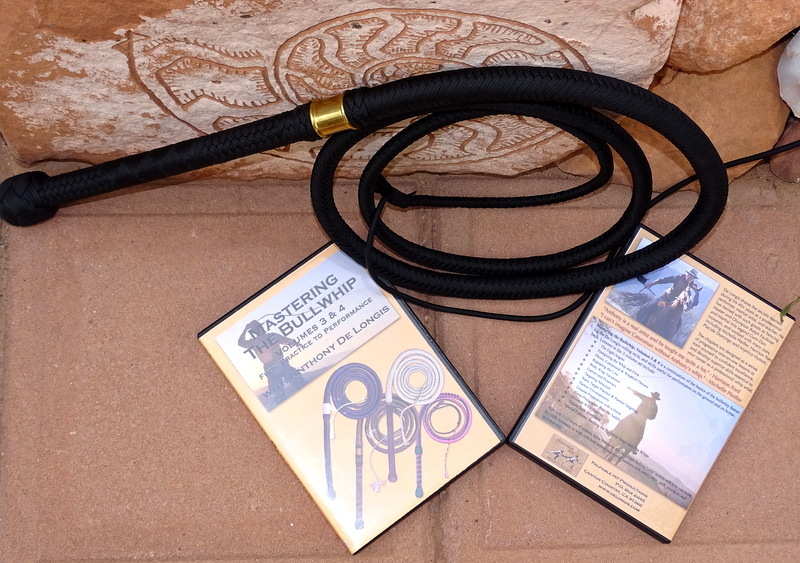 The Indalo Combo - This combo includes a matching set of one Valkyrie, one Delongis Alignment and the Mastering the Bullwhip DVD set. 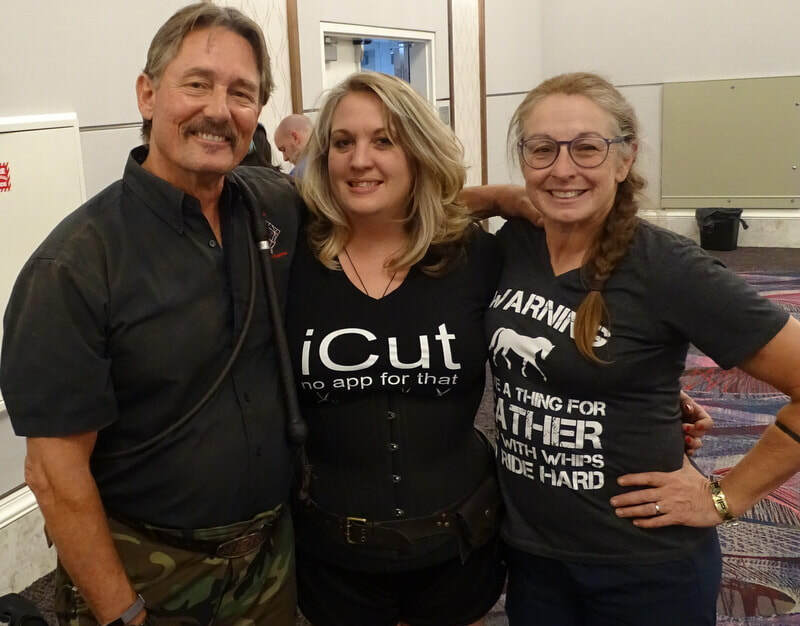 If you also happen to have and appointment to have Anthony teach you at his ranch, I will make certain that you have your whips in time, regardless of the waiting time, at no extra charge. Just have Anthony call me and let me know when to have it sent to the ranch. 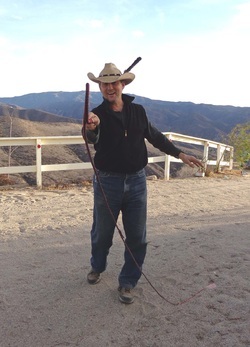 Mastering the BullWhip 3 & 4 - I was speaking with Anthony and he told me that if you have to choose between Mastering the Bullwhip 1&2 and Mastering the Bullwhip 3&4, pick 3 &4 because it is a better quality and teaches what the first one did plus more. You'll learn, angles of attack, compound throws, body wraps, targeting with and without a partner, working from horseback and much more! 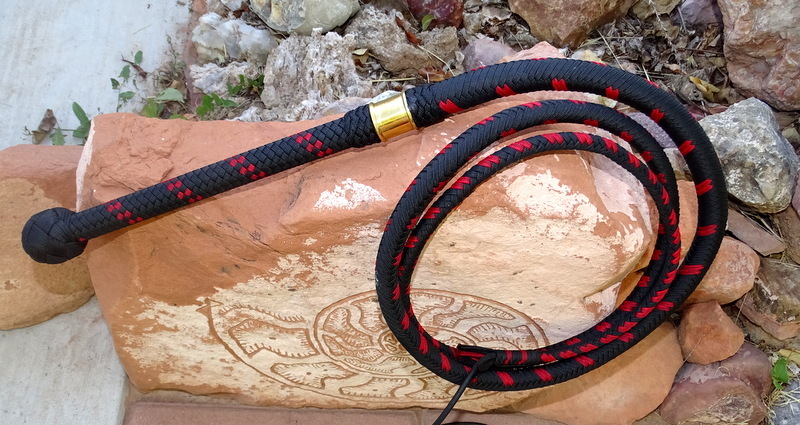 "Bobbi, you're one of the few whip makers I recommend and I pass along your info on a regular basis. I appreciated your listening to my requests when I asked you to modify your initial whip constructions and custom designing a whip that suits my needs and preferences. I find The Valkyrie to be just what I asked for. It's balanced, responsive, accurate and transitions energy efficiently and effectively from handle to the tip of the fall. These are the things I demand in a whip and exactly what I need to keep my partners, both human and equine safe in the high pressure chaos of a movie set. You give me a tool I know I can count on. The shot loading you've put in the falls you re-designed at my request give just enough extra weight through the fall to keep the whip rolling true to the very tip of the popper, even from the back of a galloping horse where I actually create my own headwind. 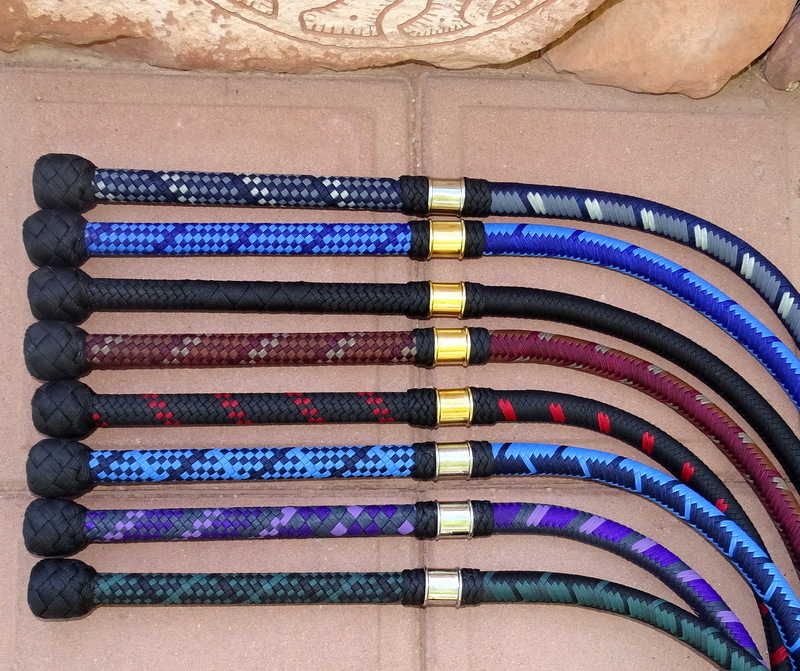 Thank you for your artistry and your willingness to design a whip that reflects the wishes and demands of your customer. Keep up the great work, Bobbi." Because of the way the Valkyrie is dropped and the fact that it ends in a 6 plait, the normal patterns are problematic. (especially the serpent patterns) So, The Valkyrie only comes in 5 designs. Any of the patterns can be made in the color(s) of your choice. All Valkyries will come with a ferrule unless you request that it not have one. A while ago I was Speaking with Anthony De Longis about heavy falls. He explained to me that it is easy for him to outrun his whip while on the horse. He had the feeling that adding weight to the fall would help solve his problem. This conversation ultimately gave birth to the first whip of this design known as "Betty". I had to name her because I got SO involved with the whip that it started to have it's own personality. She was black and blue, big and tough, also a beautiful force of nature. It reminded me of a roller derby girl and I thought "Betty Bruiser" was the perfect name. I have always loved Anthony's first comment after cracking Betty for the first time. "Betty is love at first crack. She's beautifully balanced, supple, responsive, clever and accurate -- all the things I look for in a woman and a whip." "With a HolyOak, I know folks are getting a quality tool to speed their learning curve that will give years of reliable performance and service." Here's the history of Betty's initial design from concept to final product. 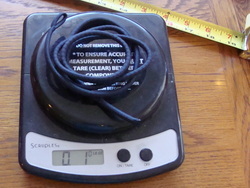 The first thing I did was take a 3 foot leather fall and put it on the scale to see exactly what it weighed. I realized that it wasn't much heavier than the nylon falls I was making. It was kind of an Epiphany moment for me. 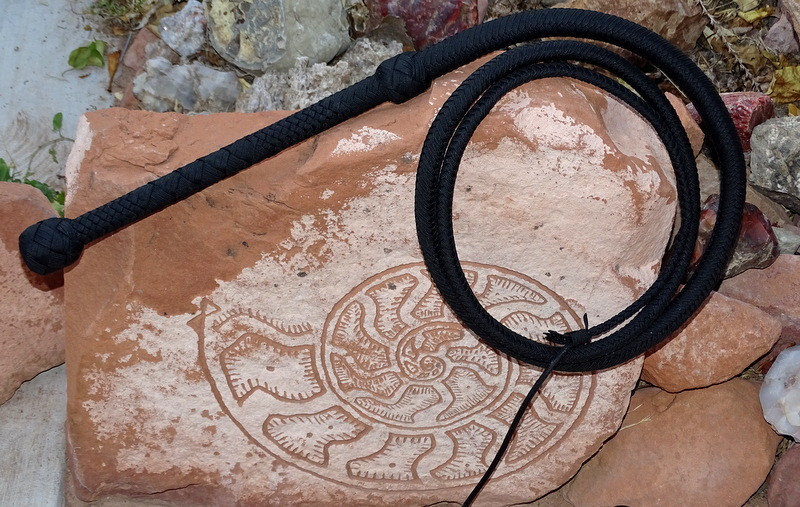 I could see that we weren't trying to recreate what a leather whip could do... we needed something new altogether. So, I got to work testing out different ways of weighting the falls. I had a few ideas that failed miserably and two that were winners. When I had the fall that was heavy enough I tested it out on a Sonic Alignment whip and found that caused a dangerous "kick back" of the whip. It would crack where I wanted it to, but then come right back at me with a vengeance. That certainly won't work when a horse is involved. It was then that I realized that a normal whip isn't going to handle this kind of weight on the end and I needed to make a whip that was balanced for a 1 ounce fall. This turned into a personal project of mine, just to see what I was capable of doing. It had to be heavy enough to need a heavy fall and at the same time feel light be workable. 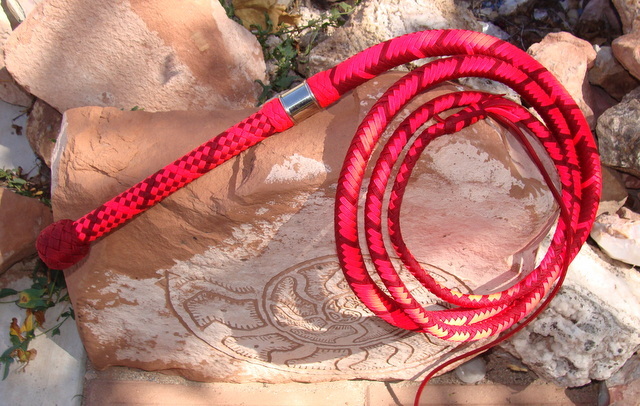 It wouldn't work if it took more energy to use this whip than normal. I obsessed over the math and measurements for a full week before settling on a design that I liked. I didn't know if it would work till I did the test crack. I'll never forget it. It was after 8pm in the winter so it was very dark and cold. I braved the dark, the snow and maybe ticking off the neighbors, in my pajamas and snow boots because I knew I would never sleep until I knew for sure. One crack and I knew it was good... two cracks and I was cheering I was so proud of the design. That is how the Valkyrie was born. Even though everyone who touched the Valkyrie loved her, I still thought this would be the only one I made because of the price of materials that go into this whip. Happily, I had several friends keep encouraging me to offer it for sale to the public and it has been really popular.